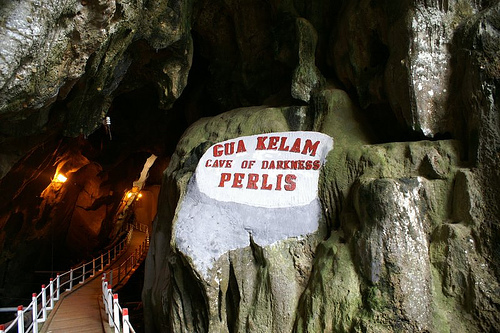 Gua Kelam, or namely ‘The Cave of Darkness’ in the English language lies at the foothills of Perlis in a town called Kaki Bukit and is a popular attraction spot for tourists. At 370 metres long, this distinctive limestone cave is accessible by means of a suspension bridge built for exploring purposes. Having this 8-foot wide wooden bridge for the cave which connects Kaki Bukit to a valley on the opposite end, namely the Wan Tangga valley makes this trip a more distinctive and intriguing for first-time visitors. As part of the Perlis State Park located in the Wang Mu Reserve Forest, another one of Gua Kelam’s uniqueness is the profound stream that flows in the mineral range in close proximity to Kaki Bukit for about a quarter of a mile in extent. From a historical past, this stream was put to fruitful use by an Englishman in 1935 as a mean to transfer tin ore from a mine sited near the stream entrance near to Kaki Bukit. But as of today, locals and foreigners can conveniently walk through this cave with the wooden bridge being brightly-lit. It is advised that visitors wear proper attire as well as shoes to prevent any accidents from occurring. Although some visitors may prefer a more relaxed walk in the cave, there are more enthusiastic travelers that aim for a challenge, and that brings Gua Kelam to suit their preferences are this cave has over 30 set-up routes and 6 climbing sites. Besides hearing the hollow sounds of the cave, they would be able to hear the soft sounds from the flowing stream and occasionally, the squeaks of bats that reside there. Visitors would be able to experience what it is like to be in a cave. Apart from that, visitors may see live aged stalactites and stalagmites. If lucky, visitors could have an eye on bats that are hanging from above. Besides bats, other various creatures are to be found, such as spiders and a variety of insects. 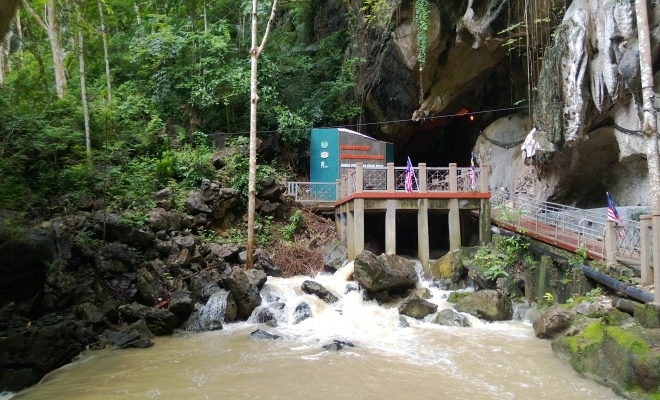 If visitors are traveling from Kangar with the intention to visit this cave, they should continue towards Padang Besar and follow the signboard that states Kaki Bukit. Another fair option would be to take the bus from Kangar’s main bus station and from there, a few minutes worth of walk to reach to Gua Kelam. In other words, Gua Kelam is easily accessible through various means of transportation.